I just tossed in a few teaspoons of premium pesto and a tad of grated cheese.The pasta was cooked for two minutes or until al dente. I added a tad of salt to the boiling water before adding the pasta. Drain, then toss though with sauce. The ingredients to the pasta; 3/4 cup of flour and one egg. That was it. I did not add any salt or water. Make a well, add the egg. 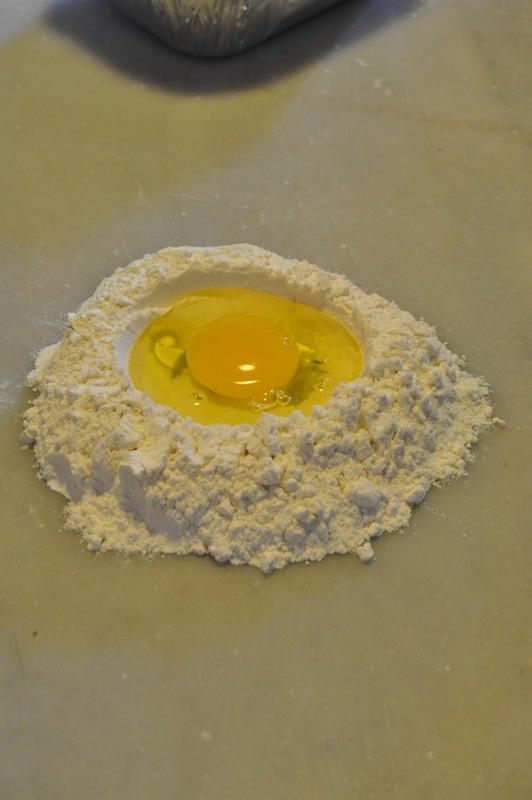 Mix the egg with fingers until all the flour is combined with the egg. You will need to knead the dough for a short time until it appears elastic~just until you get a little" bounce back with touch" in the dough. Place the kneaded dough through your pasta machine. Follow the directions for your machine to get the thickness and consistency you need before the last pass to get your long pasta. Dry for several hours on tray and sprinkle with flour to keep pasta from sticking. Enough for one serving or two small ones! I have been thinking about getting my pasta maker out of the back of my kitchen cabinet. It has been years since I've done this. Check out 00 flour from King Arthur if you get a chance.